Well our little girl is growing up right before our eyes. Some days it seems like she is going to be a newborn forever (usually when she is going into the second hour of a colic-induced screaming bend), BUT then there are days where she is full of coos and smiles and I want to freeze these moments in time. I am learning that parenthood is a careful balancing act between looking forward to the next steps in your child’s life and relishing in the present moment for what it has to offer. 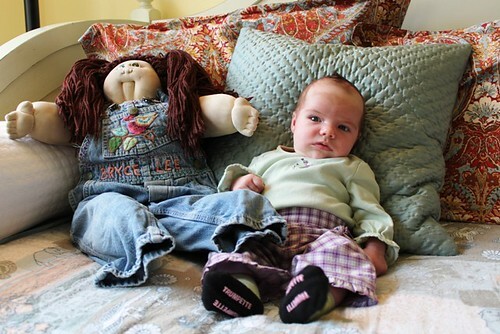 I’m going to try to take Ryan’s photo every month next to my original Cabbage Patch doll to chart her growth. Here she is at 1-month old. 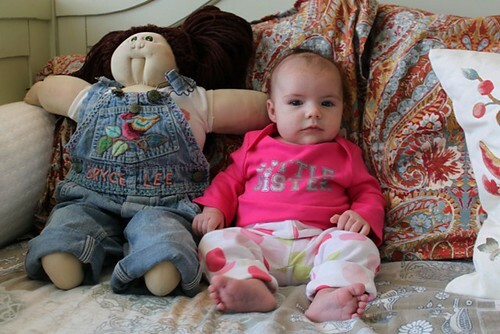 And here she is at 2-months old (please excuse all of the contrasting prints in this photo). Notice the overalls that Leslie Trixie is wearing? Those were embroidered by my mom when I was a wee-one. 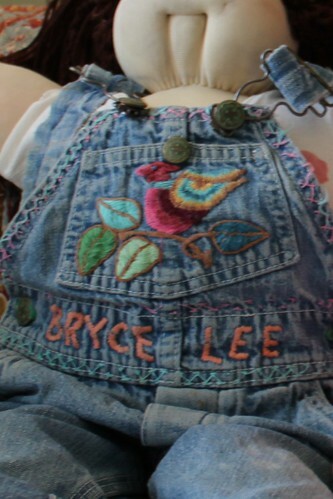 They actually say Bryce Lee on them, how cute is that? This entry was posted on December 14, 2010 at 6:00 am	and is filed under Milestones. Tagged: baby, birthday, family, life, Ryan. You can follow any responses to this entry through the RSS 2.0 feed. You can leave a response, or trackback from your own site.